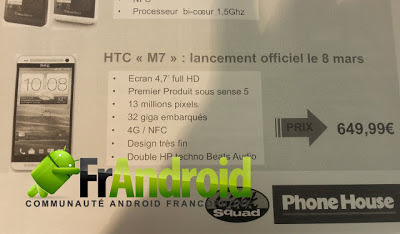 HTC's M7 supposedly leaked on PhoneHouse documents! HTC's much rumoured M7 is the company's main hope at the moment. As we reported yesterday the guys from Taiwan are having a really tough time at the moment and their January earnings proved that again. A 4.7 inch Full HD 1920 x 1080p resolution display. A 1.7Ghz Qualcomm Snapdragon Quad Core Processor. 32GB Internal Storage which is MicroSD expandable! 4G LTE and NFC connectivity. There's no mention of the version of Android on board although we expect it to be one of the two Jelly Bean versions and hopefully 4.2! All of this will cost €649.99 off contract, which works out to about $885 or £565, which seems like a lot of money to us! The device will be available on March the 8th according to the leaks! If this turns out to be correct on February 19th will you be buying or will you wait it out for some other rumoured device? Let us know in the comments below and don't forget to check out Peter Chou's cheeky demo of the M7 at HTC's year end party!